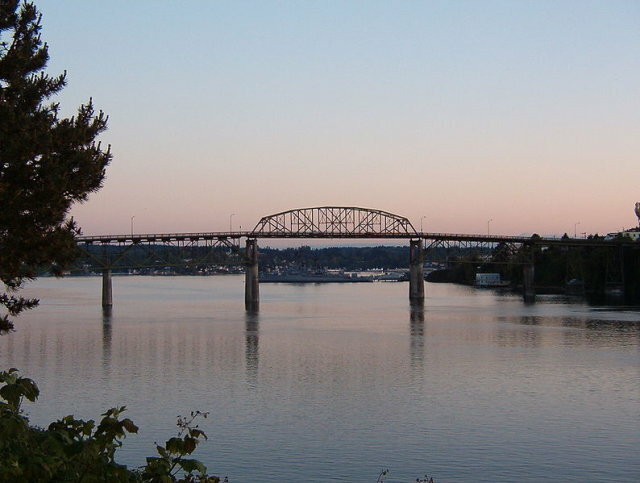 The Manette bridge as an antenna? On a windy rainy evening a few nights ago, a discussion of radio antennas occurred during a weekly radio net. That’s not unusual. What made it so interesting was the discussion revolved around this question: what is the strangest antenna you had ever used? The responses were fascinating and ranged from old bedsprings to window screens. One operator had actually used his body as an antenna for a low-powered contact. One of the most interesting responses was in the realm of I-haven’t-but-always-wanted-to, as a ham related living at the foot of a large steel bridge, and wondered what would happen if he connected to the bridge. There were memories of horizontal loops of several to many miles per side, and also a memory of a miles-long Beverage antenna. One ham on Twitter reported using a tape measure dipole. For more on strange antennas, try eHam’s 2005 article titled What’s Your Favorite Strange Antenna? If you’re interested in trying some strange antennas, you’ll find many ideas and loads of good antenna advice in the KØS Field Manual. This entry was posted in Articles for Hams and tagged antenna. Bookmark the permalink.